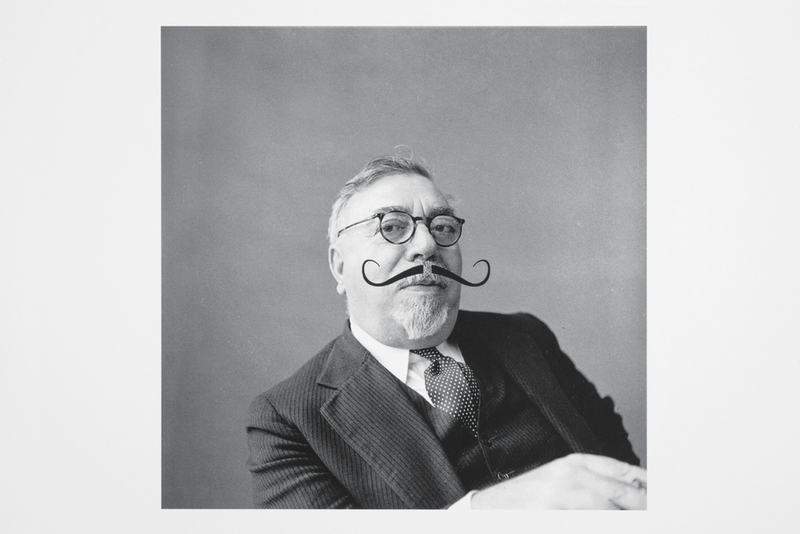 Gaviria’s WW : NW examines the ambiguity and uneasy gulf between language and code by highlighting Norbert Wiener’s ambivalence to automatic machine translation, and by lampooning Warren Weaver’s “cryptographic-translation” idea. 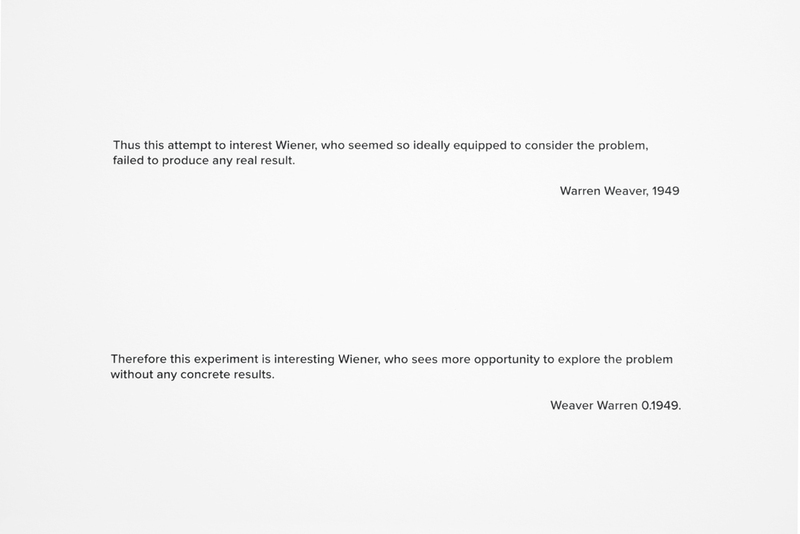 In WW : NW, Weaver’s statement “Thus this attempt to interest Wiener, who seemed so ideally equipped to consider the problem, failed to produce any real result” is run multiple times through a machine translation, returning the text to its original language, but not to its original form. 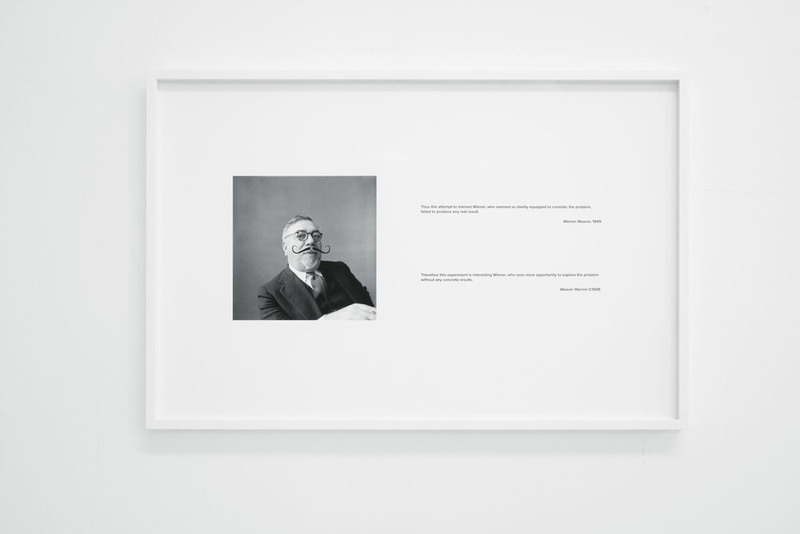 The comedic translation result "Therefore this experiment is interesting Wiener, who sees more opportunity to explore the problem without any concrete results” is counterpoised against a mustachioed Wiener. The joke Gaviria offers also has a serious side: Weaver’s proposal fails to capture the essence of language, but […] the cipher still functions. Immediately following the Second World War, Andrew Donald Booth and Warren Weaver discussed the possibility of machine translation. Soon preliminary work occurred, but the field remained relatively unknown until Weaver distributed a memorandum (1949), later published with the title “Translation,” to some 200 of his colleagues. It is from this publication on machine translation that Gaviria pulls his text, and it was this moment back in 1949 that inaugurated machine translation.